Tuberculosis is a chronic, infectious disease that primarily attacks the lungs. Tuberculosis (TB) is caused by a bacteria that primarily attacks the lungs. An individual may be "TB infected," meaning the bacteria are in the body but are in an inactive state, walled off behind scab-like structures that are the body's defense mechanism, or have "TB disease," when the bacteria actively spread throughout the body and can cause damage to the lungs or other organs. The severity of the attack depends on whether the bacteria spread from the lungs to other parts of the body. TB infection in the blood, the meninges (membranes around the brain and spinal cord), or the kidneys are the most serious. Children between the ages of six and 24 months are the most susceptible to meningitis ; it is the chief cause of tuberculin death among children. The bacteria that causes TB, Mycobacterium tuberculosis , is transmitted by droplets when an infected person coughs or sneezes. It is not spread through kissing or other physical contact. Children nearly always contract the disease from an infected adult. In 2003, the Centers for Disease Control and Prevention (CDC) reported 14,874 cases of tuberculosis in the United States, or 5.1 cases per 100,000 population. The actual number of TB infections, however, is estimated to be much higher, as high as ten million. In 2002, there were 802 tuberculosis-related deaths. The District of Columbia had the highest rates of TB, with 14 cases per 100,000 people in 2003; Montana and Wyoming had the lowest rate, with 0.8 cases per 100,000 population. Children less than 15 years of age represented 6 percent of reported TB cases, and 15–24-year-olds represented 11 percent of all cases. Worldwide, TB cases are the rise, with nearly 8.8 million new cases a year being estimated by the World Health Organization (WHO). Mycobacterium tuberculosis is a microscopic, rod-shaped bacterium. The majority of individuals who are infected with TB do not go on to have active disease. Active TB can be triggered when a person's immune system is weakened, such as from human immunodeficiency virus (HIV), malnutrition , or alcohol abuse. Early symptoms of TB include unusual fatigue, fever , loss of weight, headache , coughing, and irritability. An infected child may have night sweats and cough up blood. In advanced stages, the patient will suffer persistent coughing, breathlessness, and fever. Many times TB is not diagnosed and becomes dormant; this is known as initial tuberculosis. In severe cases among young children between the ages of two and four, initial TB can be fatal. The disease can reoccur, or reactivate, during adolescence when resistance is low, and may disappear on its own or develop into serious lung disease. Parents should contact their child's doctor if the child has been in contact with someone who has been diagnosed with or is suspected to have tuberculosis, or if the child exhibits the symptoms of the disease, particularly persistent fever, night sweats, and cough. Tuberculosis is nearly always diagnosed by tuberculin skin tests, although one can also be diagnosed by chest x rays and analysis of sputum (matter from the respiratory tract) smears and cultures. The most common tuberculin skin test is the Mantoux test, which consists of injecting a small amount of protein from the TB bacillus into the forearm. A reddening and swelling of the area after 24–72 hours signals the presence of TB. A negative result, however, may not necessarily exclude a diagnosis of TB. The disease is treated with a regimen of strong antibiotics such as Rifampin and Isoniazid for six months to two years. Because some strains of the disease are unusually drug-resistant, cultures are grown from the patient's bacteria and tested with a variety of drugs to determine the most effective treatment. In cases of strong drug-resistant strains, the child may undergo surgery to remove the infected areas. Infants with TB are usually hospitalized but children and teenagers can generally lead active lives within two weeks of beginning medication. It is imperative that the mediation prescribed be taken faithfully. With treatment, TB infection that is not drug resistant can nearly always be cured as long as patients are consistent with their medications and considerable lung damage as not already occurred. Drug-resistant TB has a lower cure rate. Without treatment, the disease will continue to progress; approximately one-half of untreated TB patients will die of the disease. Stopping the spread of tuberculosis is the most effective way of preventing its incidence among children. All adults who work with children should be screened regularly. In many communities, children are tested when they reach their first birthday and then at one-to-three year intervals throughout the school years. The medical profession is divided on the issue of screening; some physicians believe that the screening should be focused in areas of common occurrence or within high-risk populations such as foreign-born children. The practice of relying on parents to report results of the skin testing has also come under criticism from some members of the medical community. 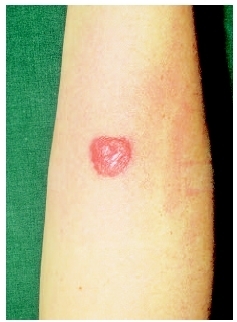 Lesion on the arm of a child infected with tuberculosis. States if they live with someone who has active TB that cannot be treated or is drug-resistant. Poor nutrition is closely related active tuberculosis; children with adequate nutrition are more resistant to the disease than those who suffer from malnutrition. If a child has been infected with TB and is prescribed drug therapy to treat the disease, it is imperative that parents closely monitor their child to ensure that the medication is taken as prescribed; if the medication is not taken frequently enough or until it is no longer needed, drug-resistant TB can arise. Mantoux test —A tuberculin skin test. Also called the PPD (purified protein derivative) test. Landau, Elaine. Tuberculosis. New York: F. Watts, 1995. "TB on the Rise." Patient Care 38, no. 6 (June 2004): 9-10. Young, Douglas B. and Brian D. Robertson. "TB Vaccines: Global Solutions for Global Problems." Science 284, no. 5419 (May 28, 1999): 1479. American Lung Association. 61 Broadway, 6th Floor, New York, NY 10006. (800) 548-8252. Web site: http://www.lungusa.com. Centers for Disease Control and Prevention. 1600 Clifton Rd., Atlanta, GA 30333. (404) 639-3311. Web site: http://www.cdc.gov. Division of Tuberculosis Elimination. "Reported Tuberculosis in the United States, 2003." Centers for Disease Control and Prevention. [cited September 12, 2004]. Available online at: http://www.cdc.gov/nchstp/tb/. Sharma, Sat. "Tuberculosis." eMedicine. January 14, 2003 [cited September 12, 2004]. Available online at: http://www.emedicine.com/aaem/topic464.htm. IF A PERSON HAS RASH LIKE THE ONE ON THE ARM ON THE NECK IS IT POSSIBLE THAT THAT PERSON HAS TB TOO? If montoux test is highly positive and fnac test is also positive then in which stage is the disease?